Have you been searching for the best mini wireless keyboard? This article is a review of iPazzPort Wireless Mini Keyboard with Touchpad Combo for Android Smart TV which is a top quality keyboard. It is black and white in color and measures 40″ h x 1.60″ w x 4.60″ l. This keyboard has different features, which proves it is the best you can consider today. You will learn a lot from this article. Check it out. It is a mini wireless keyboard which works well with Smart TV, Raspberry Pi 3, XBMC, PC, HTPC, laptop, Google and Android setup boxes. You do not need to connect a mouse or a full sized keyboard. The wireless connection – GHz and the wireless dongle are included in the package. It also includes plug and play. It has a long-lasting battery which gives you about 24 hours of use when fully charged. You can use the touchpad when you want to copy and paste or replace the mouse. Use Fn+ spacebar when you want to adjust sensitivity. Charge it for two hours then switch it on. Press Fn+F1 at once for at least 3 seconds until the light on the keyboard blinks. Plug the receiver into the USB port until the light disappears. You can now use any key to test whether it is working. It has Mini QWERTY keyboard which has multimedia controls and gaming controls for PC. Auto sleep and auto wake modes. 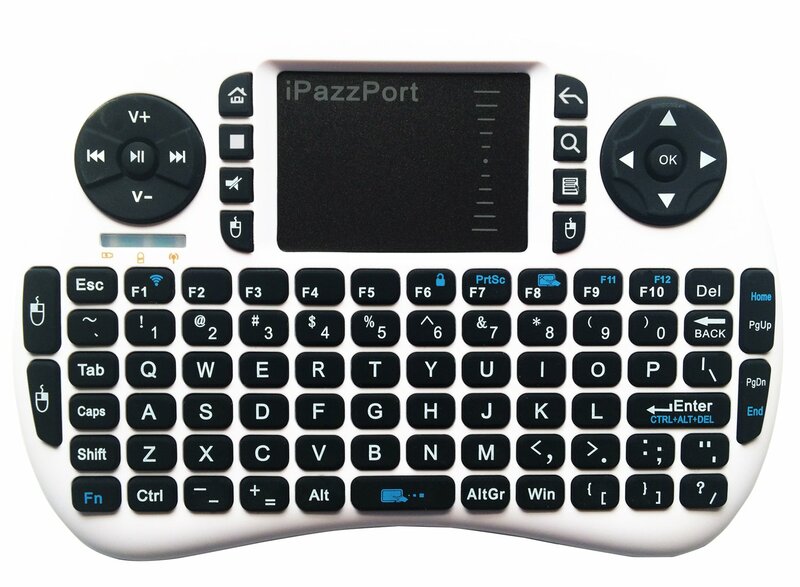 iPazzPort consists of 92 keys and a 2.4GHz wireless keyboard which has a Multi-touch touchpad. It has an elegant and a unique shape. Has a USB interface for presentation. It has an inbuilt touchpad which is very sensitive and which has a 360 degrees flip design. Comes with an inbuilt rechargeable battery. Allows you to input text easily, accesses the internet, and play games using .remote and a unified keyboard. You do not need to leave your couch for you to use it. You will get the following accessories after you have purchased iPazzPort Wireless Mini Keyboard with Touchpad Combo for Android Smart TV. You should not use it with Samsung Smart TV. The power indicator turns off when the battery is fully charged. It does not have a backlight or laser pointer. When using Windows 7 you need first to install the 2.4G driver who takes some minutes. It turns into sleep mode when it is not used for three minutes. You can press any key to wake up. It is easy to carry due to its design. You can use your computer when you are 12 meters away. It maintains the charge for a long time. You need to use USB to connect it to a receiver since it is not Bluetooth enabled. Verdict – This keyboard is indeed one of the best mini wireless keyboards because it is affordable and easy to use. If you have been searching for a wireless keyboard with a long-lasting battery, this one is the best for you. It is also portable due to its design. For sure, it is worth every cent. As we have seen, this is one of the best mini wireless keyboards for anyone in need of a quality keyboard. Most of the customers who have purchased iPazzPort Wireless Mini Keyboard with Touchpad Combo for Android Smart TV are very comfortable with its performance. Would you like to experience this also? The best thing is that you do not need to worry where to get it, you can simply purchase it on online. Go for it now. Looking for over-ear headphones? Have a look at this guide!